One of the things that I love about a new collection of fabric is having a choice of multi purpose prints. The Urban Elementz collection from Northcott has just that. Last month we had an awesome time sharing the basic fabrics from this collection. This week we’re going to play with the whole collection that includes some exciting prints. Today, we’re using French seams to finish off a fun pillow case. Click here to view Urban Elementz Patterns. Click here to view Urban Elementz BASIX. Click here to view Urban Elementz Appliques. What do you see when you look at all of these wonderful prints? What are you thinking of when you get that first glance of these fun colors? 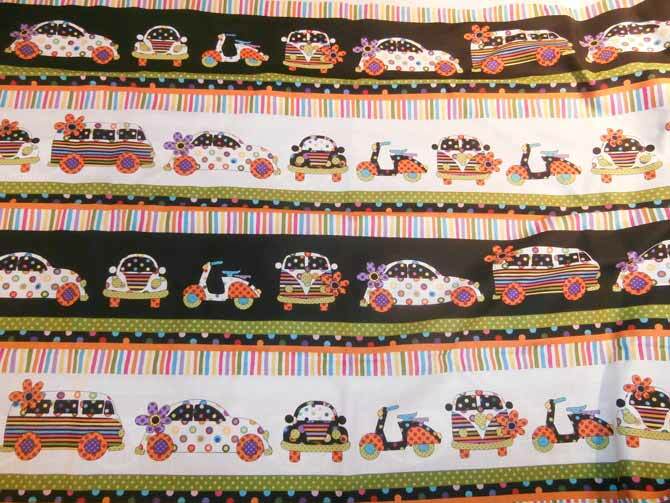 Do you wonder how you can use these fabrics in an exciting child’s quilt? Do you think that perhaps using this in last month’s projects might add even more pizzazz to the already adorable projects that we made in April? When I first saw this fabric collection, all sorts of scenarios were dancing around in my creative mind. However, there was one thought that made me get even a little more excited. I looked at these and started to see these beautiful designs as multi purpose prints. I especially started to see wonderful borders and other projects rising out of the stunning stripes. Urban Elementz 21467-10 – Striped fabric. A stunning multi purpose stripe to use in all kinds of projects. What about fussy cutting? When we think about fussy cutting, we think about trying to find a suitable portion of a print that we can cut out and add to a quilt block; perhaps a square that contains a portion of the main focus print. That certainly is something that you can do with these prints. 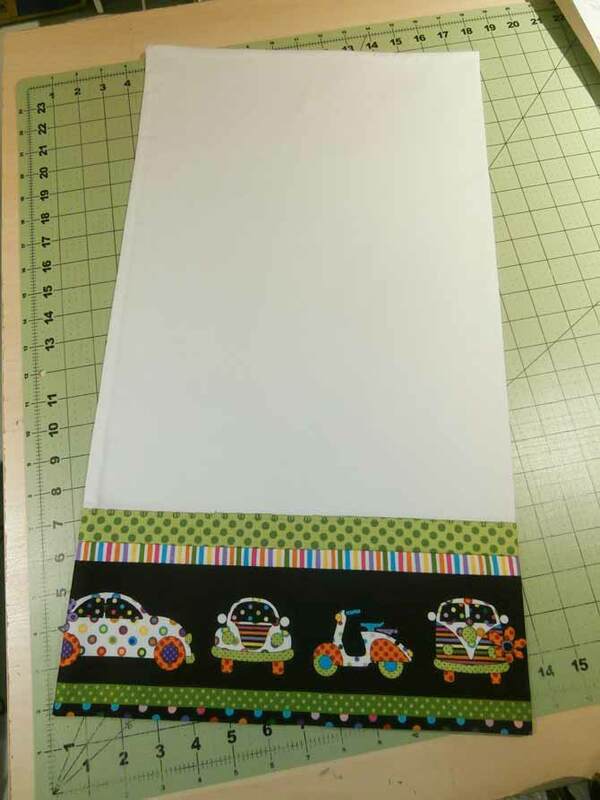 But what about fussy cutting stripes and making fun borders or other projects using the creative strips? I think that with this particular fabric we have even more options with regards to fussy cutting. What about a narrow stripe for a tie that can be used on a child’s tote or carrying case? 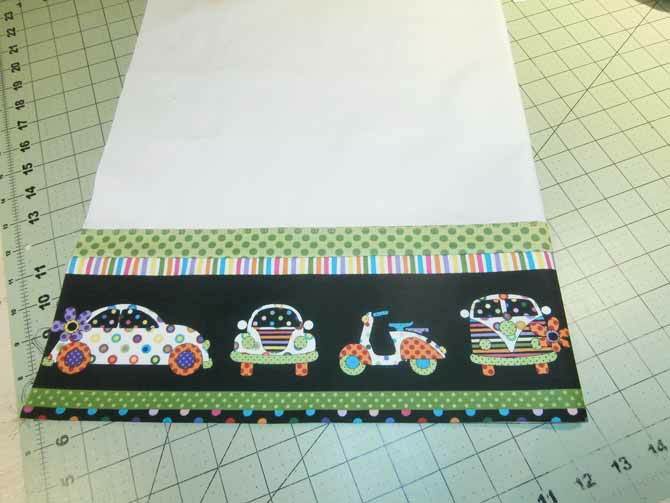 How about fussy cutting a wider stripe and creating a fun border for a child’s quilt or table runner? Do you think that perhaps we can fussy cut a stripe that can make a fantastic trim for a pillow case? Well, today I think I’ll use this fabric together with a couple of the other coordinates and do just that. Let’s make a child’s travel pillow case. What do you think? Just a reminder that when we’re introduced to a fun fabric collection such as this one, we need to let our creative spirits soar free and have fun, because there are so many things that we can do with these types of prints. The first step is to sew the fussy cut border print to the white base fabric of the pillow case. 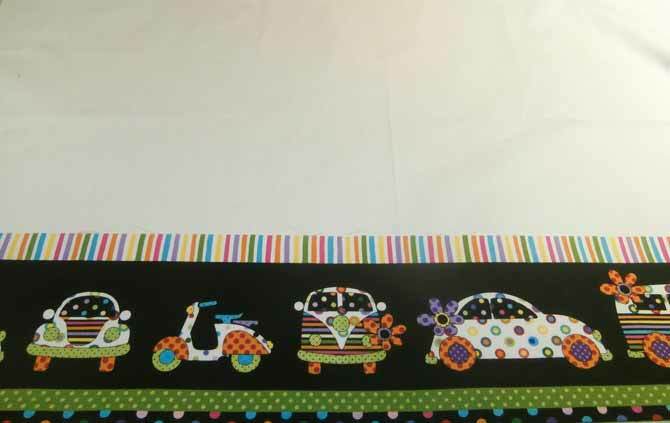 You stitch the border print along the bottom edge of the white fabric. Layer the border stripe along the bottom edge of the white fabric, wrong sides together with the bottom 28½” long edge of the border print stripe aligned with the 28½” raw edge of the white fabric. Stitch along the 28½” edge using a ¼” seam allowance. Flip the border to the front of the white fabric, and press the seam. The border print is now laying along the bottom edge of the pillow case base fabric. The fussy cut border print is stitched to the bottom of the pillow case base fabric. Fold the green dot strip in half, wrong sides together with the long edges aligned, and press the fold. 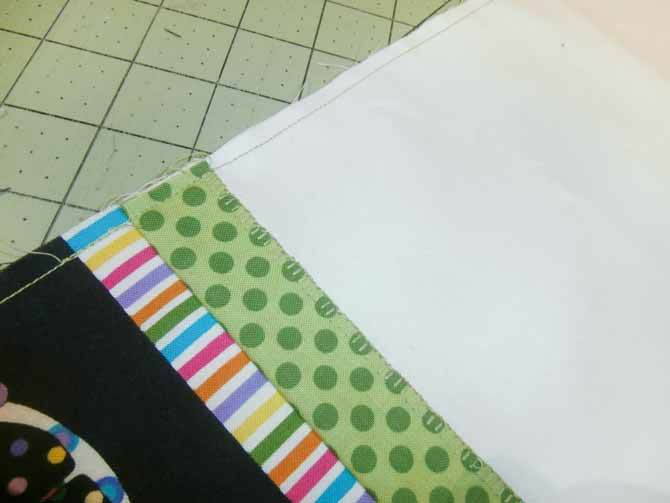 Lay the strip on top of the border stripe with the long raw edges of the border stripe and green folded strip aligned. Stitch in place using a ¼” seam allowance. Flip the green dot strip towards the top of the pillow case, and press. Pin the green dot strip in place. 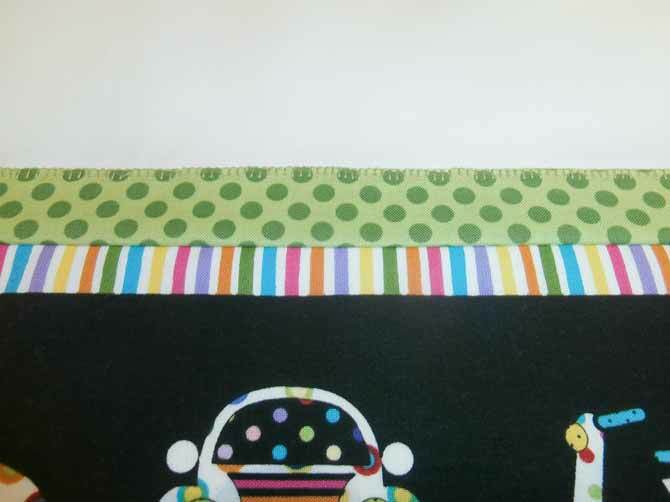 The green dot stripe is stitched to the top of the border print stripe, flipped towards the top of the pillow case, then pressed and pinned in place. Using the blanket stitch on your sewing machine, stitch along the folded edge of the green dot stripe to attach it to the pillow case base. The top of the green dot strip is attached to the pillow case top with a machine sewn blanket stitch. Now that the border is complete, let’s assemble the pillow case. Fold the pillow case in half, wrong sides facing, with the 24½” edges aligned. With the border complete, the pillow case top panel is folded in half, wrong sides facing, with the 24½” edges aligned. Stitch along both the side and the end with the raw edges, using a ¼” seam or less. The pillow case is stitched along the raw edges using a ¼” seam or less. Turn the pillow case wrong side out. You use a French seam to close the raw edges of both of the seams that you just stitched. For the side and the end of the pillow case that you just sewed, stitch along the same edges, this time using a ¼” seam, or slightly larger. This step encases the raw edges inside of the seam. With stitching complete, turn the pillow case right side out and press. 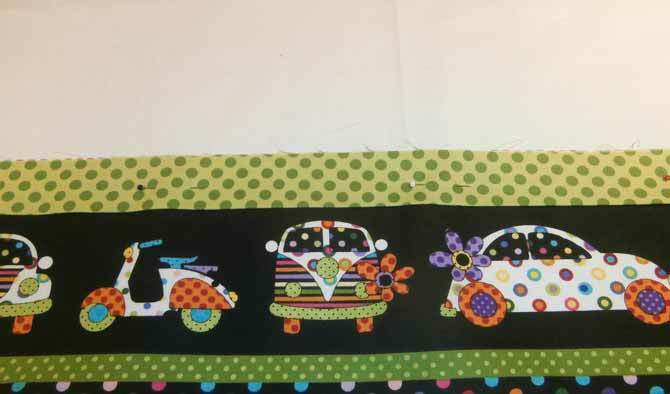 A pillow case for a child’s travel pillow. How adorable is that? This project is just one of many ways that we can have fun with multi purpose prints such as this one from Northcott’s Urban Elementz collection. I hope that you’re inspired to look for different ways to use fun prints in your projects, and try out new techniques such as French seams. Be sure to check back tomorrow when we’ll have fun with another project using this collection.